Republicans: If Poor Carter Page Can Be Wiretapped, Who Among Us Is Safe? Donald Trump reportedly sees a Republican-authored memo as the rationale he needs to fire Rod Rosenstein and replace him with a deputy attorney general who will, as the president has so frequently demanded, offer his complete personal loyalty. But conservatives have concluded that the memo, written by Trump ally Devin Nunes, serves a far loftier purpose: Its advocates are motivated by a sincere concern about civil liberties. 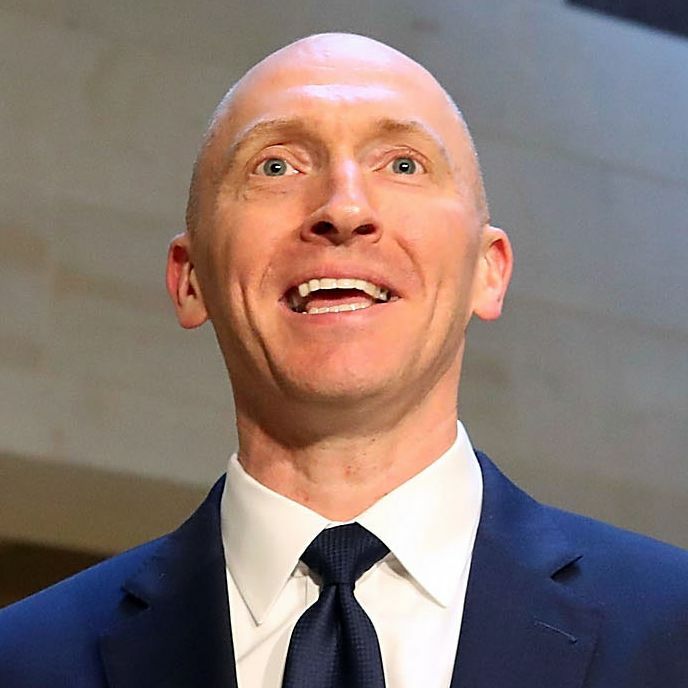 The Washington Examiner’s Byron York reports, “One reason some Republicans cite for their interest is based in civil liberties: If they’ll do it to Carter Page today, they’ll do it to you tomorrow.” National Review editorializes, “[F]rom what we know of Nunes and his colleagues, they have long been sincerely alarmed at what they’ve learned about how the FBI operated in 2016.” Sincerely! The case in the memo, as it has been laid out in the media, runs as follows: The FBI wiretapped Carter Page, a hapless Trump foreign policy adviser, on the basis of allegations compiled by British investigator Christopher Steele. When it obtained court approval for this wiretap, the FBI allegedly failed to disclose that Steele’s reporting had been financed by Democrats. Therefore, the surveillance of Page – and, as Trump and many of his allies see it, the entire Russia investigation — is illegal and tainted. Poor Carter Page is simply the canary in the coal mine of American civil liberties. There are several flaws with this apparent theory. First, reports have indicated the FBI began investigating Page well before Steele looked into him. Page met with Russian spies who were looking to recruit him in 2013, and passed documents to them. The Russian spies came away from the encounter confounded by his apparent stupidity (“I think he is an idiot and forgot who I am”) but encouraged by his greed (“He got hooked on Gazprom. It’s obvious that he wants to earn lots of money”). CNN reported last August that the FBI began surveilling Page in 2014, two years before the Steele dossier. In 2015 — again, before Steele came along — U.S. investigators overheard Russians discussing “meetings held outside the U.S. involving Russian government officials and Trump business associates or advisers,” The Wall Street Journal has reported. The FBI may have used reports in the dossier to support its bid to renew surveillance of Page. But this means the Republican memo is focused on one supporting document in the renewal of an ongoing investigation. It is not challenging the central basis of the investigation of Page. Second, even if it were true that the FBI based its entire case for surveilling Page on the Steele dossier, the dossier is not necessarily false. It was a series of reports compiled by an experienced private investigator for an allied government. The tips Steele found were leads to be pursued. Some of them could be borne out, and others falsified. The point of it was to identify suspicious grounds for investigation, which is what the FBI had already been doing anyway. Third, as USC law professor Orin Kerr points out, the legal basis for the memo’s civil-libertarian complaint is moot anyway. “There is lots of litigation on whether warrant applications need to discuss the bias of informants,” Kerr points out, and it does not support the Republican charge that the warrant should have been denied. And as former FBI counterintelligence agent Asha Rangappa explains, there are procedures governing FISA warrants, and it is extremely unlikely that the FBI could use weak or unverified rumors to justify surveillance that needs to be renewed every three months. Now, it is possible that House Republicans take a different, and much more alarmist, view of federal surveillance authority. But it is odd that this bout of civil-libertarian fervor should strike just days after House Republicans voted to renew section 702 of FISA — the provision that authorized* the surveillance — with no reforms or limits whatsoever. Perhaps York is right that the plight of poor Carter Page has shocked Republicans’ slumbering civil-libertarian conscience. To me, though, “If they’ll do it to Carter Page today, they’ll do it to you tomorrow” does not strike me as a terribly likely possibility. It might have more punch if I had, say, passed documents to Russian spies who were trying to recruit me as an asset, attended secret meetings with Russians in Europe, misled both reporters and Congress about those meetings, and delivered a bizarrely strident pro-Russian nationalist speech in Moscow. Maybe these kinds of life choices are more common than I realized. And yet the tender civil-libertarian sensibilities of House Republicans appear to be entirely unperturbed by the well-documented intent of the president of the United States to turn federal law enforcement into a personal weapon. Trump is publicly and privately pressuring the Department of Justice to investigate the candidate he defeated last fall. Shouldn’t the newfound ACLU-niks in the House GOP caucus find that prospect just a wee bit more threatening? I have made the 702 point in print myself but ur description is off. This was a Title I FISA warrant on Page, hence the existence of an application to a judge. 702 is warrantless surveillance - no applications, no judges. And they made some changes to 702, tho not sweeping ones. The overall point about the incongruity between the expressions of concern for Page’s civil liberties, and lack of concern about reauthorizing warrantless wiretaps, stands.